Regardless of your existing location Yacht Consultants Asia (HK) Ltd. offers professional Consultation to the global Yachting Community. Full or part time project consultation will depend on your needs, whether it’s finding the right builder for your one off yacht or starting a new Marine related venture, expanding an established company, negotiating, or marketing. 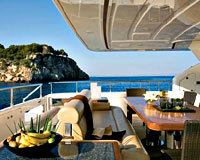 YCA (HK) Ltd is able to offer practical answers to yacht related inquiries at a fraction of the cost of you being here. Our team and associates can physically work on a full time basis... or visit your cooperative partners / manufacturers as required by the project. Our experience in Yacht construction and production allows us to understand your requirements, comparing them to existing resources quickly and accurately. We can provide accurate reports to any degree of complexity, and introduce new products or technology. Our technical familiarity with Western and Asian production environments allows us to identify and report real time activities, keeping you at the helm, where you should be. Building a new yacht(s) is probably the most time consuming, technically complicated, and expensive undertaking that most people will encounter. Modern as well as traditional yacht construction techniques. All aspects of Yacht design. Assist in cooperation with Classification Societies. One off or production Yacht construction in Asia. Locate key personnel to run your interests in Asia. Sourcing products to your specification. Effective marketing translation for marketing brochures and presentations. Arrange reception and plan effective itineraries for your visits to the west. Locate key personnel to represent your international interests in Asia.